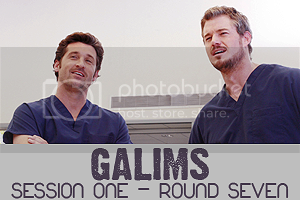 Welcome to our icon challenge community for the amazing tv show Grey's Anatomy. This is a Last Icon Maker Standing (LIMS) competition which means each week a member is voted out until we're left with our Last Icon Maker Standing. Please check the userinfo page and the follow links for more details and our rules. Finally LJ gave me back the administration of this community >_< a jerk hackered it and cut me from the Admin board... I'm mad at him/her. NOT FUNNY, IDIOT!! Ready for the last round? Replace the #00's with the numbers of the icons you are voting for. This is the last reminder to enter round 8. All icons are due Saturday, November 28th, 01:00pm (GMT). Anyone who does not submit by then will be disqualified. This is the first reminder to enter round 8. • you can't participate unless you are signed up and your name isn't crossed out here and you're not in the list below. • skips no longer may be used & immunity will no longer be awarded! Don't forget to vote in this weeks challenge. Please note that only entrants who vote are eligible to win people and mod's choice, so vote!